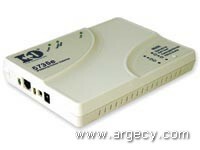 The I-O 5735e IPDS/SCS Printer Gateway is a high speed Ethernet-in, Ethernet-out AFP/IPDS - SCS gateway print server designed to convert native IBM host print jobs to PCL, allowing them to be printed by a laser printer on the LAN. Supporting one printer, the 5735e delivers IBM AFP/IPDS and SCS printing via TCP/IP, providing the control and printer feedback found in an IBM host environment. High Speed Printing, 100+ ppm The I-O 5735e takes advantage of high-speed, high-performance printers without the bottleneck of the parallel port. Enhanced Telnet 5250 (TN5250e) and Telnet 3270 (TN3270e) Communicates with the IBM Host using native TCP/IP. Off-loading of Data Conversion Eliminates unnecessary overhead by converting EBCDIC data to ASCII data directly on the I-O 5735e.